If your website is targeting multiple languages or locations, hreflang tags are an integral part to your technical SEO success. Google’s John Mueller recently Tweeted about the complexity of hreflang tags, even for advanced SEO professionals. TBH hreflang is one of the most complex aspects of SEO (if not the most complex one). Feels as easy as a meta-tag, but it gets really hard quickly. What is an hreflang Attribute? An HTML ( rel="alternate" hreflang="x") markup that denotes the language or region your webpage is targeting. The attribute makes sure Google knows which page to rank, in which language and in which location (i.e. in Google US, UK, etc). The hreflang tag is important because it can help your website get more exposure for international search queries. If your website is only in 1 language, the tags will not improve performance. Transpose rankings across SERPs. For example, ranking for “Nike shoes” in Google US will not translate into equal rankings in Google Mexico. Fix errors with duplicate content. The hreflang tag does not function like a canonical tag. Hreflang attributes should be used for content that’s specific to a local audience. The tags help Google understand the relationship is between your pages in alternate languages and regions. link rel="alternate" href="http://example.com/" hreflang="en" link rel="alternate" href="http://example.com/en-gb/" hreflang="en-gb"
The attribute tells Google that http://example.com has an “alternate” (i.e. duplicate) page. That page can be found at http://example.com/en-gb/ and it’s written in British English. Misused Language and Country codes are a common error that can hurt your rankings. Triple check your codes before implementation. There are several instances where you will want to consider using the hreflang directive. Neil Patel translates his blog posts into 5 different languages to maximize traffic to his site. 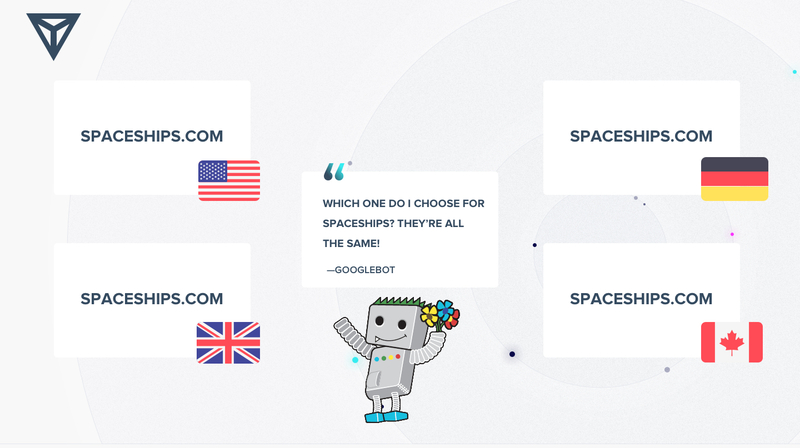 href="https://neilpatel.com/" hreflang="en" href="https://neilpatel.com/br/" hreflang="pt-br" href="https://neilpatel.com/de/" hreflang="de" href="https://neilpatel.com/es/" hreflang="es" href="https://neilpatel.com/it/" hreflang="it"
When you want to distinguish the difference between two locations, that speak the same language. CNN uses a subdomain to target UK readers but the same domain to target US and Canadian audiences. href="https://edition.cnn.com" hreflang="en-gb" href="https://www.cnn.com" hreflang="en-us" href="https://www.cnn.com" hreflang="en-ca"
Before hreflang tags, the common practice to capture international searchers was to use multiple Top Level Domains (TLDs). If you have multiple top level domains, you’ll still want to link them with hreflang tags. ASOS uses a combination of TLDs, subdomains and subfolders to manage their international presence. hreflang="es-ES" href="http://www.asos.com/es/" hreflang="de-DE" href="http://www.asos.de/" hreflang="en-AU" href="http://www.asos.com/au/" hreflang="fr-FR" href="http://www.asos.fr/" hreflang="ru-RU" href="http://www.asos.com/ru/" hreflang="en-GB" href="http://www.asos.com/" hreflang="en-US" href="http://us.asos.com/"
This is complicated setup – most likely left over from legacy, stagnated regional launches. Generally speaking, best practice is subfolder structure across a single domain. This preserves SEO equity and reduces effort required to manage multiple domains. 1. HTML link element in the header. This is generally the most followed route. You’ll need to write the hreflang attributes and then have a developer insert them into the <head> on all the pages needed. rel="alternate" href="https://webris.org" hreflang="en-us" rel="alternate" href="https://webris.org/es/" hreflang="es-co"
Aleyda Solis has a great tool to help you generate the code. If you publish non-HTML files (like PDFs), you can use an HTTP header to indicate a different language version of a URL. Plugins can bloat load times and are better suuited for smaller sites. There’s a lot of SEO tools like SEMrush that can flag issues you might be having. But for deeper technical audits, you’ll want a more hands on approach. You can start by mimicking Google search results from other locations. This can be done by altering the URL string. Google has a full list of CCTLDs language and reference sheet – you can review the Google docs version go here. Errors with codes – Tag used in the wrong order or incorrect selections. Triple check your tags before implementation or check legacy tags for validity. Errors with Sitemaps – If implemented via sitemap, make sure to follow Google’s guidance. It’s easy to miss ASCII codes which can break sitemaps. No alternative page – no HREFLANG required. Don’t use HREFLang without a link to an alternative page – this can cause GSC to return errors that could cause a lot of wasted time troubleshooting. Don’t use HREFLang on pages you have set to NOINDEX. This can result in a number of errors. If you’re in need of help with your website’s international SEO, let’s talk! The post How to Implement Hreflang appeared first on From The Future.